“FORM EVER FOLLOWS: Iterative Design Objects” by visiting curator Mark Baker ’06 will be exhibited in the Peter Paul Luce Gallery at Cornell College from Jan. 17 through Feb. 28, 2016. Bent Mirror Series by Nina Cho. 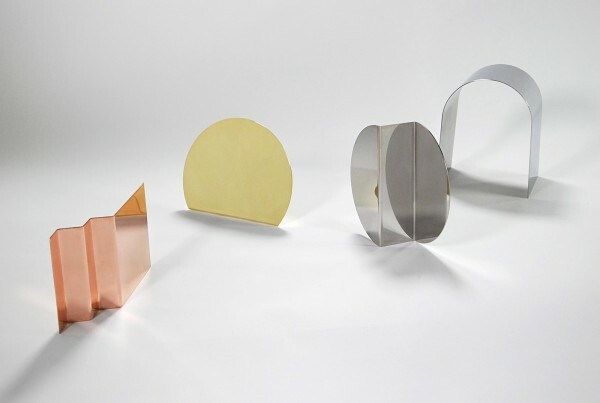 Polished brass, copper, stainless steel, 2015. An opening reception will be held Sunday, Jan. 17, in McWethy Hall, with a gallery talk by Baker at 3 p.m. He will speak about curating this exhibition, the choices that lead to this body of work, and his own design work for the exhibition. Baker is the head preparator and exhibition designer at Cranbrook Art Museum in Bloomfield Hills, Michigan. He earned his bachelor’s degree in art from Cornell College, and received his MFA in 3D Design from Cranbrook Academy of Art in 2011. Baker has worked for museums, collectors, foundations, and art consulting firms for the past seven years. His work has been shown and collected throughout the United States, and has been exhibited at the International Contemporary Furniture Fair in New York. His designs have been reviewed and featured on the Art and Design blogs Hyperallergic, Design Milk, and Wallpaper. “Few phrases loom as large over the design fields as ‘form follows function,'” Baker wrote in a statement about the show. When Louis Sullivan penned his now famous dictum (originally “Form Ever Follows Function”), he was urging architects and designers to distill their creative output—one function, one form—in an effort to create a synergy between the two. Sullivan’s assertion was that thoughtful development and execution of form might help to establish a relevant and contemporary style within the American landscape. This early modern ethos was a benign-enough pursuit, however performance and efficiency of industrial production ultimately took precedence over expression, iteration, and spirit. Designers began to adopt a linear approach that limited formal exploration as even minor deviations of form could result in production delays and costly re-tooling for manufacturers. Today, the craft of design is a complex matrix that supports self-manufacturing, one-offs, and mass customization, where each work can be the prototype of the next. Form Ever Follows examines these variations, multiples, and permutations within contemporary design. Gallery hours are Monday-Friday 9 a.m.-4 p.m. and Sundays 2-4 p.m. Peter Paul Luce Gallery programming is funded through the Henry Luce Foundation Inc. Admission is free and open to the public. For more information contact Sue Coleman or call 319-895-4491.